Rick Perlstein on how the Republican Party will recover from Trump. How the Republican Party will try to explain away Donald Trump’s disastrous campaign. Photo illustration by Slate. Photos by AFP, Brian Blanco/Getty Images. When I last spoke to Rick Perlstein, the historian of modern conservatism, Donald Trump had shocked the country by rising to the top of Republican primary polls. He hadn’t yet won a single state, however, and the thought of him as the GOP nominee still seemed absurd. Now, with three weeks until the election, Trump’s unprecedented candidacy has upended American politics. It has also riven the Republican Party, an organization that Trump ostensibly leads and quite clearly has no use for. Perlstein’s series of books about the Republican Party and the conservative movement began, in 2001, with Before the Storm: Barry Goldwater and the Unmaking of the American Consensus, and continued with Nixonland (2008) and The Invisible Bridge: The Fall of Nixon and the Rise of Reagan (2014). This week, I spoke again by phone with Perlstein, who is also the national correspondent for the Washington Spectator. I wanted to hear his thoughts on how Trump’s candidacy will reshape American conservatism and the Republican Party. During the course of our conversation, which has been edited and condensed for clarity, we discussed what Trump has revealed about the Republican Party’s agenda, his similarities to Richard Nixon, and whether Trumpism can survive as an ideology without the man himself. Isaac Chotiner: If Trump loses by a relatively large margin, how do you think the GOP and the conservative movement will respond? Rick Perlstein: I think there will be a giant split and there will be a lot of working through, to use the Freudian argot, but parties are very strong institutions in the American system. The rules favor them so profoundly. Building power in a third party is like building a skyscraper by starting on the 20th floor. Something called the Republican Party will exist. You hear this every time. You heard conservatives talking about building a third party in 1974 and 1975 after Watergate. Both the Republican Party and the Democratic Party, even after McGovern, have a history of resilience. As you know from my Goldwater book, everyone was declaring the death of the Republican Party unless they purged the conservatives, but they really didn’t and they got back all their gains in 1966, because this new issue of housing and the backlash against riots and the militancy of the civil rights movement. Ideologically and strategically, how do you think Trump’s loss will be understood among Republicans? I’m kind of famous for coming up with a little epigram, “Conservatism never fails. It is only failed.” I came up with this during my long experience of studying the right, and realizing that basically anything that is politically successful is kind of labeled conservatism. Any failure is wiped off the books in this bad faith utterance that well, of course it failed because it wasn’t conservative. Romney wasn’t conservative enough. McCain wasn’t conservative enough. “Bush wasn’t conservative,” you began to hear in 2004, when the wheels came off the bus with Iraq, and all the rest. That’s what we’ll hear, “Of course, Trump lost. He wasn’t conservative.” That allows everyone else in the Republican Party, basically, to push the infamous reset button. I think a lot of what we saw in the last couple of weeks with Trump’s various former supporters jumping ship, ostensibly because of this grotesque tape and the rest, is all about setting up that next move in the chess game. Everyone who has paid any kind of attention knew that Trump was this kind of guy in the first place. I think what we’ll see is the Paul Ryans and the Ted Cruzes, jockeying for the position of King of Conservatism saying, “We need to wipe the slate clean and go back to Reagan.” The dilemma that raises is that Trump has raised energies in the Republican electorate that may not be able to be so easily contained. So then do you see Trumpism as a grass-roots movement that really could change the party from within? Is there Trumpism without Trump? Yeah, thank you. We can switch jobs. Don’t forget, there is Donald Jr., you know. At the Republican convention, I was out getting a hot dog or whatever when this really boring, droning, incoherent sounding, whiny guy was talking, and I was like who is this, he’s terrible, and it turned out it was Jeff Sessions. Trump’s charisma is nowhere present amongst his most common Washington supporters. But Trump is revealing contradictions in the Republican coalition in a really profound way. The neo-liberalism in the Republican agenda has never been popular. I have polls from 1984 showing people thought that the level of regulation was perfectly fine, they were perfectly happy paying the level of taxes they were paying, all these sorts of things, and yet, Reagan won 49 states. It must have been something else, right? Trump complicates the analysis because he’s shored up his support among the Conservative establishment by outsourcing his tax plan to Stephen Moore and looking more like a traditional conservative, but he certainly doesn’t talk a lot about it on the campaign trail. On the campaign trail, it’s all about the fecklessness of Republican elites who have allowed his voters’ hometowns to turn into ghost towns. How do Republican leaders respond to that? It seems like what you’re saying is that small-government Republican conservatism was never that popular and now that Trump has exposed that, we might get real change. I wouldn’t say never that popular. I would say that the aspects that were most popular about it were the ones that a lot of the mainstream Republican leaders were most ambivalent about. The dog-whistle racism stuff. The radical anti-institutionalism. The stuff that Grover Norquist cared about was shrinking the size of the federal government. You don’t really hear Trump talking about that. Do you think that these appeals will become more blatant now that Trump has demonstrated their appeal? My father-in-law escaped Nazi Germany in 1939. My wife pointed out to him that if Trump was a decent family man who was able to discipline himself and was able to execute a smart campaign strategy that was designed by a sophisticated strategist … and my father-in-law cut her off. He said, “He would be a shoo-in.” And that’s the fear. This was the fear that you saw a lot in the decades after the European catastrophe of fascism, the fear that a demagogue who kind of broke the norms of American politics would have it easy, that it really was this sort of scrim of civility that kept the demons at bay. There are these sort of wildfires that can break out unless you have responsible grown-ups in charge of the Republican Party. They always understood that the forces that they were playing with were dangerous. This is why we see someone like George W. Bush going to a mosque the week after 9/11. I think he understood. He blundered into calling it a crusade, but he backed off right away. He wasn’t that smart and didn’t understand this language, but he was very careful not to turn this into a crusade against Muslims, because he knew if it did, we’d be seeing what we’re seeing now. As Sam Rayburn said about politics, anyone can knock down a barn, it’s building a barn that’s hard. Hillary Clinton has chosen, mostly, to run against Trump as a sui generis figure, and she has tried to welcome Republicans into her campaign. Do you think this is a good strategy? I refuse to type that phrase when I’m transcribing this interview, so we may have to cut it. I expect to see it in the final transcript. She made it pretty clear that she was tying Trump to the Grover Norquists of the world, the Paul Ryans of the world. What about in terms of her agenda? If she wins with Republican support, do you worry her progressive agenda will be weakened? I’m not worried about it in terms of her agenda. The other day I allowed myself the fantasy of what a Clinton presidency is going to look like, and of course the big tactical question for every new president is which of their bills they introduce first, because that’s the one they have the most political capital to get across. I was like, well, it could be her paid family leave bill, it could be her bill for free college for everyone making under $125,000 and the debt relief for everyone. It could be her new tax credits for the very poor, who Peter Edelman—who resigned from the first Clinton administration over welfare reform—has said is the best poverty program he’s seen in a long time. I was like, wow, there really isn’t anything on her plate that isn’t a pretty strong, progressive, populist intervention. I’m pretty certain that there’s very little room for her to abandon that. She’s laid down some pretty strong markers. This is the Hillary Clinton who in her first major speech after the Democratic convention went to Planned Parenthood and gave perhaps the most unflagging, straight ahead, pro-choice message of any Democratic presidential candidate. I had no idea you were getting so pro-Hillary. After she gets impeached in year three for corruption, I’m going to call you back and we can have this conversation again. Frankly, when it comes to the corruption stuff, I just think it’s all smoke. I’d say she’s an ordinarily corrupt politician. You also have to get people to vote because this party is full of maniacs, and the party is going to outlast the orange-haired monster, right? This is one of the things that I think is a tragedy of Obama’s presidency. He didn’t really put conservatism in his sights in a way that Reagan put liberalism in his sights. He [de]legitimized it for a generation, but it’s a problem of language. Lots of people call themselves conservative. I think when pollsters ask that, it’s often temperamental, people mean that they uphold personal initiatives and dignity and self-control. Coming up with something like extremism or reactionary or right-wing radicalism, who knows, there have been various formulations, but that is definitely a problem, and part of the problem is that any message that you come up with from a podium has to be understood and conveyed in an effective way by the media, and the radicalism of the Republican Party is something the media has a very hard time conveying because of their professional canon in which basically there are two parties of equal moral weight. Sadly, Ron Fournier is another name I refuse to transcribe, so this isn’t going to make the interview, either, but it’s a good question. We could call him The Ghost of David Broder. On the question of Trump’s uniqueness, how do you compare him to George Wallace, who you have written about? OK, so zero for one. He really was able to keep the trains running on time and manage a complex governmental unit in the form of the State of Alabama. Points to George Wallace there. But his ability and willingness to spur his audiences and constituency to whatever rage it took to empower himself is quite similar. Also, Wallace had so much more to work with. Compare the riots in Baltimore over Freddie Gray in which one CVS went up in flames to the riots in Chicago in 1968, where literally two straight miles of Madison Street, the main street through the black South Side, was rubble. A lot of this stuff Trump has to kind of, I wouldn’t say invent, because he certainly believes it’s true, but when he says that American cities are more dangerous than Afghanistan, it’s just nonsense. George Wallace could say that violent crime had quadrupled since he was a kid and he’d be right. After the first day of House impeachment hearings in the Judiciary Committee, the chairman, Peter Rodino, basically scooted everyone out of the room because there was a rumor that a plane was headed toward the Capitol and people thought that we wouldn’t put it past Nixon to do that. The famous story about James Schlesinger telling the generals not to accept any order, to check in with him first. You know the saying, “Never get mad unless it’s on purpose,” and mostly Nixon honored that. He very, very rarely lost control in public. 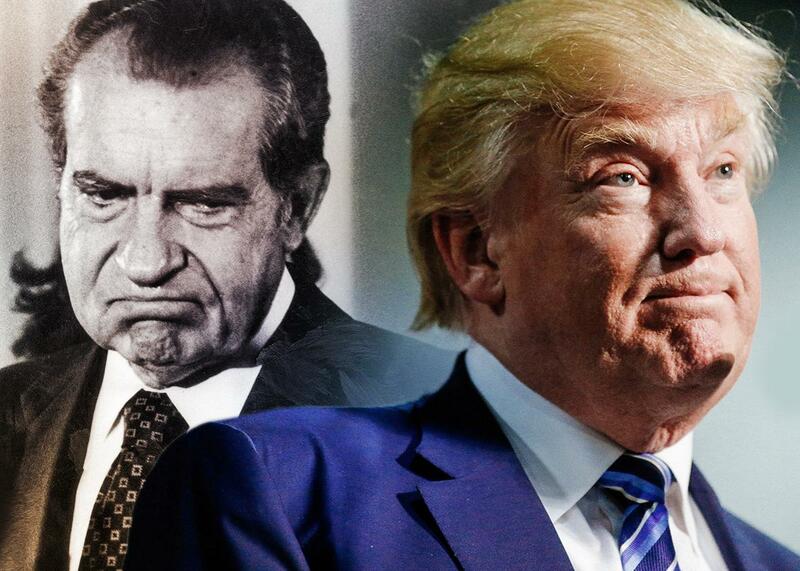 Our picture of Nixon is profoundly enhanced by the fact that we know what he said in private. It was really, really shocking to people, probably the most shocking thing of all, when the White House transcripts came out and it turned out he said hell and damn. Donald Trump Is another animal entirely. Whereas with the Trump Access Hollywood tape, it was precisely what everyone assumes the guy is like in private. Yeah, the Trump tape is Trump.